LONDON (Sporting Alert) — English Premier League points standing heading into the game on Monday night between defending champions Manchester City and Crystal Palace. 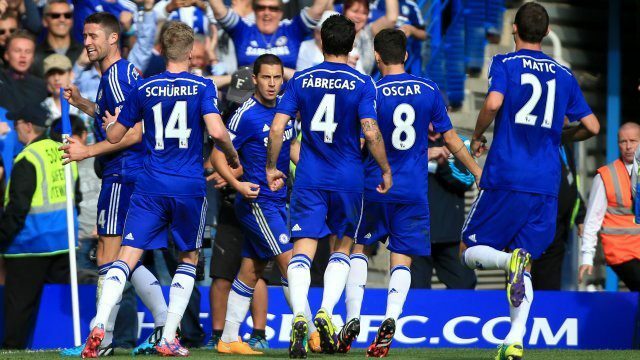 Chelsea, with a game in hand, continue to lead the table standings after scoring a 2-1 win over Stoke City Sunday. The Blues are on 70 points, seven more than second place Arsenal, while Manchester United, who also leapfrog Manchester City — are sitting third with 62 points. The Gunners hammered Liverpool 4-1 at Anfield, with United taking care of Aston Villa 3-1 at Old Trafford. Man City sit fourth on 61 points, but can return to second place with a victory at Selhurst Park on Monday and manager Manuel Pellegrini has revealed that his squad is healthy heading into the fixture. Liverpool, in the meantime stayed fifth, but are seven points off the top four after the Arsenal defeat, while Tottenham also missed the chance to move further up the table standings after being held 0-0 at Burnley on Sunday. Southampton, who were beaten 1-0 by Everton are sitting seventh on 53pts, and that result put another dent in the Saints’ hunt for Champions League football. The top 10 is completed by Swansea City (46) in 8th place, West Ham United (42) in 9th and Stoke City (42). The battle for survival is also as hot as the hunt for European places at the top, with Burnley, Queens Park Rangers and Leicester City not giving up. QPR delivered a “not going to roll over and die” performance against West Bromwich with a 4-1 thumping on Saturday and Leicester City edged West Ham United, 2-1 on the same day.